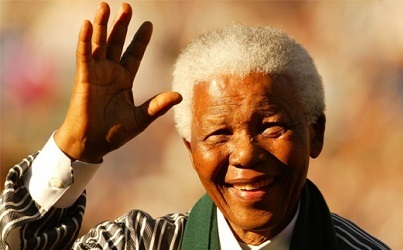 It has been nearly a week since Nelson Mandela passed through the Portal of Mystery, and I’ve been thinking about him each day, sometimes just for a moment, sometimes for long enough to write a poem. Here is one that came to me on December 5, the day his body died. but at birth in the village of Mvezo. whose seeds smell like almonds when crushed. A few days after writing the poem, some friends whom I love and I were gathered at our tiny church in front of a picture window, singing Psalm 72, “Justice will flourish in his time, and fullness of peace forever.” Just then, a flamingly handsome robin alighted on the branch of a crabapple that grew right outside the window and, looking directly at the delighted singers, he began pulling on the red fruit, bending the branch of the tree in the process. 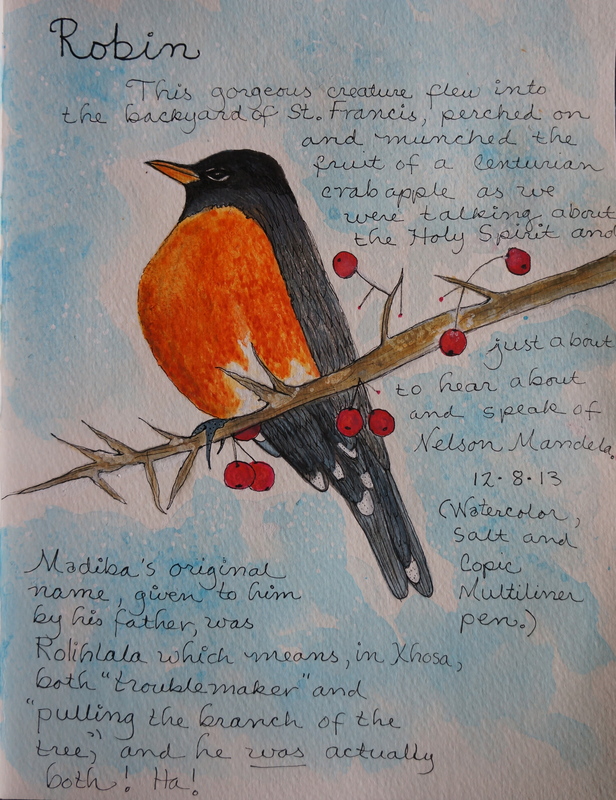 The next day, I painted the robin in my journal. I would call this ‘paying attention’–that’s what you’re doing—being alive to wonder–and nothing is ordinary—and your story reminds me of Paul Auster’s ‘The Red Notebook’–a collection of personal vignettes organized around his belief in synchronicity. Thanks J! Sort of reporting on what I see. Finding stories wherever, whenever… as we all do. I’ll have to read ‘The Red Notebook’ soon. Like a gratitude journal, I think starting a synchronicity journal might be in order. Maybe that’s what I’m already doing though. This is such a beautiful, moving tribute to a man who moved me for so many years! I heard the news as I was boarding the plane to NYC, and cried throughout the weekend, or found him in my thoughts constantly. This really honors such a magnificent man! Dawn, I appreciate your comment very much. Honor, is exactly what I had in mind. I wanted to do that by using some of Rolihlahla’s first language, so I had to go back to the beginning when he was first named…and suddenly there was the metaphor. It was a gift to me. The mystical connection you made at St Francis between Madiba, Robin and tree branch is a fitting, meaningful and beautiful tribute to such a forgiving and so-loved man. Oh, wow, Dawn! Thank you so much! This is an incredible honor and a wonderful gift, as well. I will check out the details. Love you, too! Thanks Kate. We are carrying him in our hearts. Hugs back!